Burundi’s electoral crisis takes place alongside an interesting realignment of its political landscape: former foes have joined forces, while allies can’t find ways to sustain partnerships. During the 2010 elections, the Tutsi-dominated Union for National Progress (UPRONA) party led by Charles Nditije turned away from the opposition, which had boycotted the elections, and participated in the electoral process. As a result, they were awarded key seats in Parliament and important government posts. A few years later, Nditije was pushed out of the government by Nkurunziza and replaced by the more amenable Concilie Nibigira, who happily took over the leadership of the party in government. Nditije then turned to Agathon Rwasa, his former enemy and head of a radical Hutu group, to form a political alliance. Today Concilie’s UPRONA finds itself on the losing end of the electoral process and its alliance with the ruling National Council for the Defense of Democracy–Forces for the Defense of Democracy (CNDD-FDD), as contested results of the parliamentary elections saw the party awarded only two seats. Meanwhile, the Rwasa-Nditije coalition, which had effectively boycotted the elections, won over 20 seats. But that coalition seems to have since faltered as Agathon Rwasa, Nkurunziza’s most viable rival, decided to join Parliament with other members of the National Liberation Front (FNL), while Nditije and its allies refused to take their seats in protest of the electoral process. 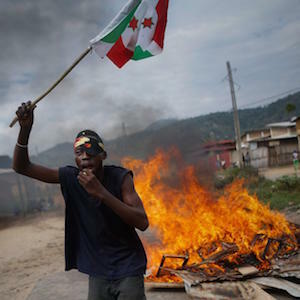 Often forgotten from the narrative is the Hutu-dominated Front for Democracy in Burundi–Nyakuri (FRODEBU-Nyakuri) of Jean Minani, which was until recently known as an ally to the CNDD-FDD. In 2010, FRODEBU-Nyakuri joined the CNDD-FDD and UPRONA by participating in the elections and won five seats in parliament. However, the party chose to boycott these last legislative elections. Equally interesting is the fact that CNARED unites under its umbrella defectors of the CNDD-FDD, other opposition parties, and members of civil society, continuing the blurring of the lines between political and apolitical groups. A number of African ambassadors attended Nkurunziza’s inauguration ceremony – notably from Tanzania, Kenya and Egypt – along with others from China and Russia. Also in attendance was South African Deputy Minister of Security, Ellen Molekane. The Catholic Church, which vehemently opposed Nkurunziza’s third mandate, was represented by Monseigneur Rugerinyange Anatole. Finally, some members of the Amizero y’Abarundi political coalition, including now Deputy Head of Parliament, Agathon Rwasa, were also present. Former enemies Nkurunziza and Rwasa exchanged a warm embrace, which appeared to cement Rwasa’s decision to engage with the ruling party. It is, however, important to note who was absent from the ceremony. No heads of state attended the event. While represented by diplomats, the European Union and the United States (US) did not send ambassadors. The African Union (AU) and the East African Community (EAC) were not represented either. Some diplomatic missions sent apologies and said they were unable to attend given the last-minute schedule change, though this may have been a way to politely decline the invitation. It is also worth noting that the Ugandan government – a key member in negotiations – was not aware of the plans for an early inauguration and expressed its concerns over the sudden change. Another significant point is that during his inaugural address, Nkurunziza announced changes to Article 129 of the constitution to lower the 5% threshold of votes required for a party to be included in the government. According to the president, the move would allow the National Unity Government to be more inclusive. Interestingly, Article 129 also stipulates that the government must be comprised of 60% Hutu and 40% Tutsi members. This amendment could therefore allow the ruling party to also change the ethnic quotas anchored in Arusha. Ethnic and gender quotas have already been eliminated from the internal rules of the national assembly, raising concerns about the ruling party’s commitment to ethnic-based power-sharing. Finally, Nkurunziza urged religious organisations and civil society groups to refrain from political involvement, and announced that a law limiting the scope of their activities would soon be passed. With a comfortable majority in government, the ruling party is sure to maintain legislative control – and it may be inclined to further curtail inclusive politics and the political space. Meanwhile, the level of violence has escalated on both sides of the political divide. Like we saw following the 2010 elections, most of the violence appears to be between political actors. Highly prominent individuals have been attacked. On 2 August, General Adolphe Nshimirimana, an insider to the president’s inner circle and widely seen as Burundi's de facto internal security chief, was killed in a rocket attack. Two days later, on 4 August, prominent human rights activist Pierre Claver Mbonimpa was shot and severely injured on his way home. On 15 August, former army chief, Colonel Jean Bikomagu, was shot dead in front of his house. Finally, on 22 August, Pontien Barutwanayo, the only commune administrator representing Rwasa’s FNL, was assassinated, leaving little doubt that all political parties are vulnerable to the current insecurity. But while these high-value targets heighten tensions, it is the ordinary Burundians who continue to bear the brunt of the political violence. Indeed, young members from both the opposition and the ruling party are the primary victims of assassinations and extra-judicial killings. These killings stem from a combination of opportunism and political targeting. The great winner in the story, at least for the moment, is Nkurunziza. But this victory requires nuanced analysis. While Nkurunziza has succeeded in forcing a way to maintain the presidency – and this despite weeks of protests, opposition from the AU and Western donors – this has come at high cost to him and the country. The attempted coup and continued violence by some armed elements of the opposition point to divisions in the armed forces. Moreover, General Adolphe’s assassination has demonstrated that even Nkurunziza’s inner circle is vulnerable. Politically, while Nkurunziza has maintained a considerable level of popularity, many Burundians no longer recognise him as the legitimate president. Additionally, months of unrest have crippled the economy. The Burundian government has been strengthened ties with Russia and China, which is likely to yield some sort of financial assistance in the near future. Nevertheless, the violence has slowed down foreign investment and led key donors to reconsider their aid. This, in turn, has added to continued challenges in providing basic services to citizens. Unless Nkurunziza restores confidence and economic assistance, he may face increased discontent. A recent communiqué by the US State Department noted that Nkurunziza’s inauguration does not signal the end of the crisis. The ruling party says it is now willing to engage in dialogue to form a government of national unity. Given that many in the opposition don’t see Nkurunziza’s presidency as legitimate, it may be challenging to find willing interlocutors. But as young people on both sides of the political divide continue to die, the apparent disengagement of regional actors is unacceptable. We have yet to understand whether the AU military experts and human rights observers, who were in Burundi during the attacks on General Adolphe and Pierre Claver Mbonimpa, fulfilled their mission and attempted to de-escalate the situation. Similarly, an increased level of violence has seen no public engagement by President Museveni, the EAC’s appointed mediator. Preventative diplomacy may have failed in Burundi, but it is imperative that those mandated to mediate the conflict promptly resume their engagement.